The very first version of the professional computer program TrichoScience © was released in March of 2004 and same year presented in Moscow, Russia. The first official international introduction of the Software to medical and research specialists in Trichology field was performed by its creating team in September of 2008 at the European Academy of Dermatology and Venereology 17th EADV Congress in Paris, France. Due to a quick progress in hair and scalp studies and rapid advances in diagnostics of their various disorders and diseases, the program keeps gradually updating and expanding with new specific techniques and analyses in Trichology. 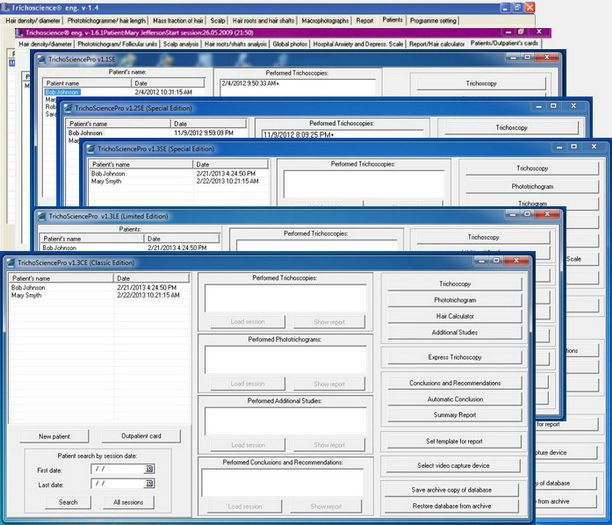 By 2012, after the original TrichoScience© program has got the total of seven version releases, the first completely upgraded version of the software with additionally developed diagnostic modules and functions, operated under special program manager interface, was introduced under the new TrichoSciencePro© name. The first TrichoSciencePro v1.1 version, combining most of accumulated by the time specific studies in Trichology, was first introduced in March of 2012 at the 70th Annual Meeting of the American Academy of Dermatology in San-Diego, California, United States and its full official presentation followed in June of 2012 at the European Hair Research Society EHRS 16th Annual Meeting in Barcelona, Spain. As a result of constant Software advancement, its next update was released in form of the TrichoSciencePro v1.2 version with some improvements, in particular addressed for certain introduction at the 71st Annual Meeting of the American Academy of Dermatology in Miami Beach, Florida, United States in March of 2013. Next release of the software, including very new automatic and semiautomatic hair detection modes and other important functional upgrades, was introduced with TrichoSciencePro v1.3 version. Its pilot version was first presented at the 2nd International Congress of Trichology event, which was combined with the 38th Annual Conference of International Associaton of Trichologists and took place in Buenos Aires, Argentina, in November of 2013. The TrichoSciencePro v1.3 software with its three different editions, targeted towards in-depth medical and research study goals, as well as for use with any clinical and non-clinical practices, was fully released in January of 2014. And released in September of 2015 the latest TrichoSciencePro v 1.4 version, with other important functional upgrades allowing for wider range of equipment choices and server intallations, was introduced at 23rd Annual Scientific Meeting of International Society of Hair Restoration Surgery, which took place in Chicago, Illinois, United States, in Septemebr of 2015 and at 9th World Congress for Hair Research in Miami, Florida, United States, in Novemeber of 2015, with its later revisions presented at Arab Health 2016 in Dubai, United Arab Emirates in January of 2016, 74th Annual Meeting of American Academy of Dermatology in Washingto, DC, United States in March of 2016 and 17th Meeting of the European Hair Research Society in Tbilisi, Republic of Georgia in June of 2016. One of the special signs of our Software professional worldwide recognition is the fact, that Lexington International LLC, the developer of internationally known Hair Max laser brush in United States, after evaluating at a time various hair analysis software systems, has chosen our software, as the most comprehensive and accurate computer program to be used for control of numerous clinical studies performed to prove laser efficacy in hair loss treatment for FDA 510(k) medical device clearance approval back in January of 2007. The more recent sign of recognition of the successful software progressive development, which meets the highest up-to-date requirements in Trichology, is the fact that headqutered in Australia International Association of Trichologists has appointed it for all members worldwide as the best diagnostic and analysis software for Trichology practice in November of 2013.